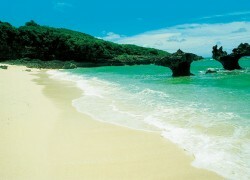 This beach is located on your right as you arrive on Kouri Island via the Kouri Bridge. Although the beach may not be the best snorkeling spot on the island, with its shallow, crystal-clear water and sandy bottom it provides a safe swimming experience for everyone, including children. Rental services for snorkeling equipment and beach parasols, a shop, restrooms and shower facilities are available.